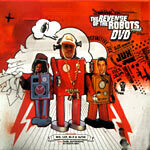 First ever DVD from Definitive Jux boasts live footage from the Revenge of the Robots tour, as well as a 1 hour film documenting their journey from North America to Europe. You get Murs' video with Shock G & Humpty Hump, 'Risky Business' and other fresh vids from the Jukies. And if that's not enough, you get a BONUS CD exclusively mixed by RJD2 that includes 3 exclusive live tracks and the Devoulution interactive trivia game. Whew!